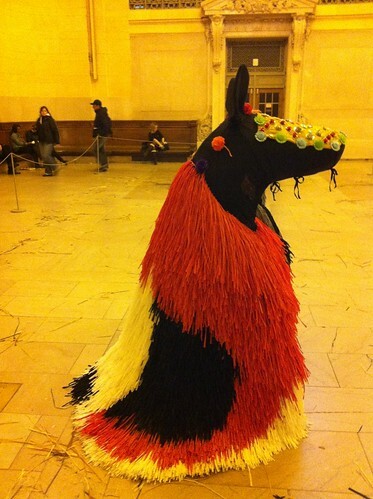 on thursday night we stopped by vanderbilt hall to visit artist and fabric sculptor nick cave's* HEARD NY, a collection of handsome pantomime-horse-haystacks which was in town for the week as part of the station's centennial celebration. i tucked an itinerant little piece of crepe-hay in my pocket before we left, and i chewed it thoughtfully as we walked past the moon-luminous empire state building; i was up until three with terrible indigestion that night and was pretty sure i deserved it. we returned in the morning to watch the herd come alive with bellyfuls of dancers, each beast bending its glorious neck for the little hands at the edges of the crowd. i could tell you i stopped being sorry i'd eaten the bit of hay then, but you and i both know i'd never regretted it. *not to be confused with nick "release the bats" cave, though i certainly did (he writes novels and collaborates with kylie minogue; why shouldn't he build pantomime horses?). the mixup was lucky, really: it led to my initial visit.